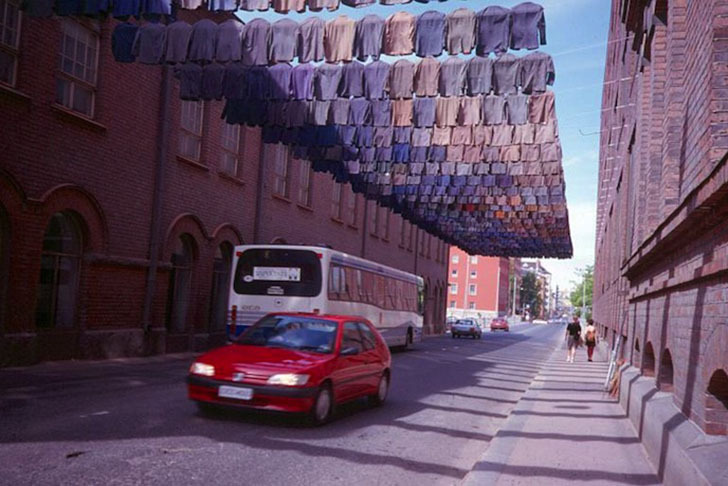 Finnish environmental artist <a title="Finnish Environmental Artist Kaarina Kaikkonen Makes Dreamlike Second Hand Landscapes" href="http://www.sculptors.fi/kuvanveistajat/kaikkonenkaarina/teoksia.htm" target="_blank">Kaarina Kaikkonen</a> creates ethereal, dreamlike landscapes from repurposed <a title="Finnish Environmental Artist Kaarina Kaikkonen Makes Dreamlike Second Hand Landscapes" href="https://inhabitat.com/new-catclo-laundry-additive-could-create-air-purifying-clothes-to-reduce-pollution/" target="_blank">clothes</a>. 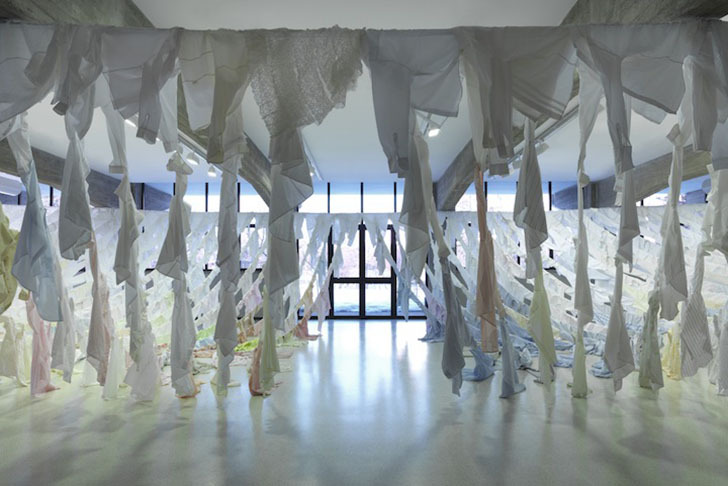 Her latest work, entitled ‘Are we still going on?’ was recently installaed at <a href="http://www.collezionemaramotti.org/it/Home-Page">Collezione Maramotti</a>, a former Max Mara factory that now houses contemporary art. 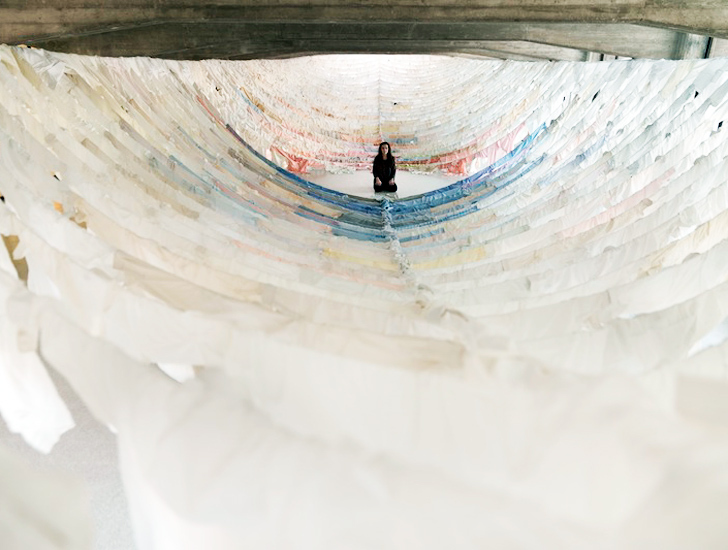 <a title="Finnish Environmental Artist Kaarina Kaikkonen Makes Dreamlike Second Hand Landscapes" href="http://www.sculptors.fi/kuvanveistajat/kaikkonenkaarina/teoksia.htm" target="_blank">Kaarina Kaikkonen</a>'s huge site-specific installation contrasts with the <a title="Finnish Environmental Artist Kaarina Kaikkonen Makes Dreamlike Second Hand Landscapes" href="https://inhabitat.com/piet-hein-eeks-restaurant-in-eindhoven-is-filled-with-beautiful-upcycled-designs/" target="_blank">former factory’s</a> brutalist architecture. 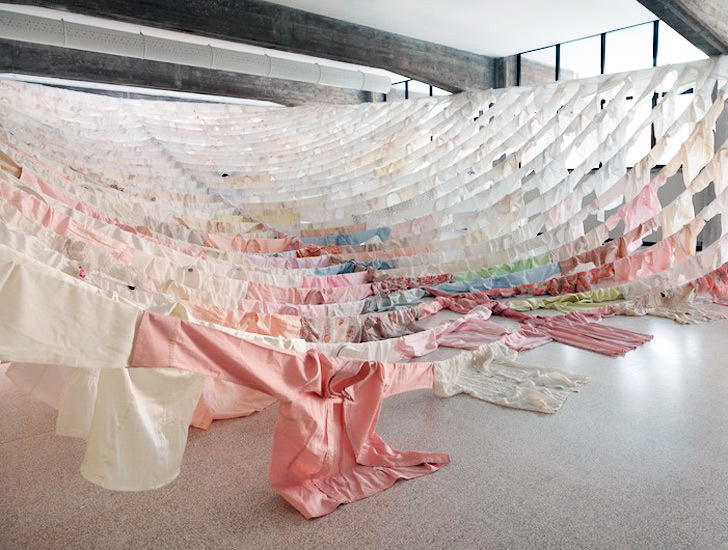 It consists of hundreds of second-hand shirts that together to create flowing forms. 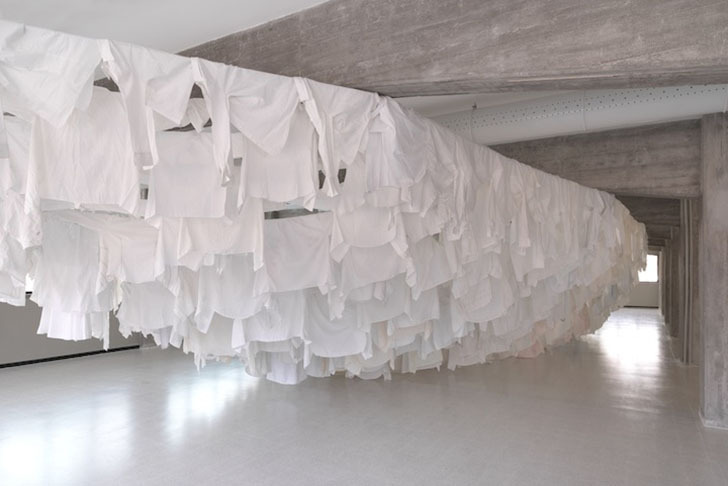 The garments, which seem to be holding hands, speak of the history of clothing production while creating a dialogue between the masculine and the feminine. 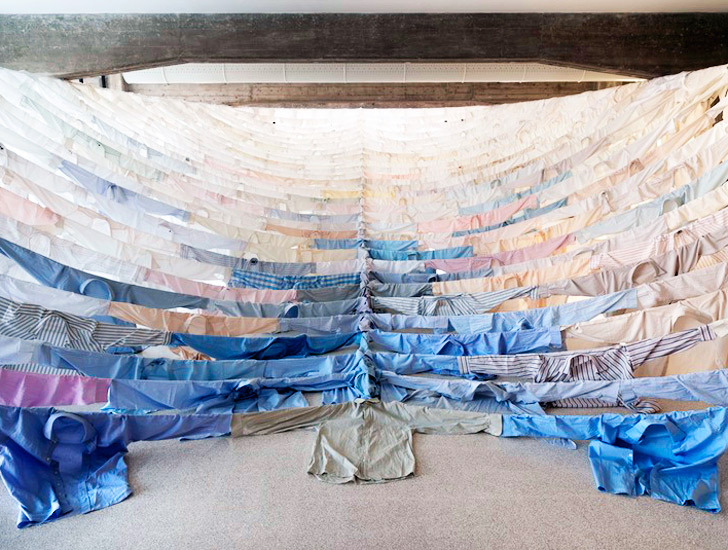 The shirts have been neatly organized by color into a form resembling the interior hull. The garments' rhythmic repetition and past lives call to mind the fragility of human beings. The exhibition ‘Are We Still Going On?’ and other artworks at the <a title="Finnish Environmental Artist Kaarina Kaikkonen Makes Dreamlike Second Hand Landscapes" href="http://www.collezionemaramotti.org/it/Home-Page" target="_blank">Collezione Maramotti</a> can be seen until 21 April 2013, at Reggio Emilia, <a title="Finnish Environmental Artist Kaarina Kaikkonen Makes Dreamlike Second Hand Landscapes" href="https://inhabitat.com/abici-launches-ultraportable-update-to-historic-italian-velocino-bicycle/" target="_blank">Italy</a>. 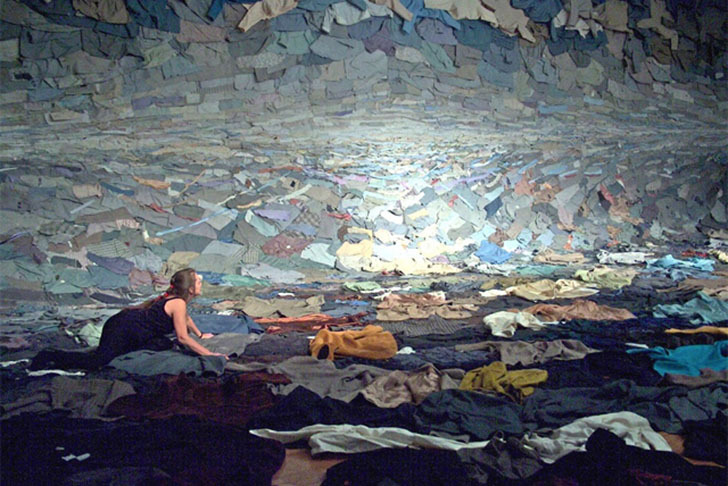 Finnish environmental artist Kaarina Kaikkonen creates ethereal, dreamlike landscapes from repurposed clothes. Her latest work, entitled ‘Are we still going on?’ was recently installaed at Collezione Maramotti, a former Max Mara factory that now houses contemporary art.